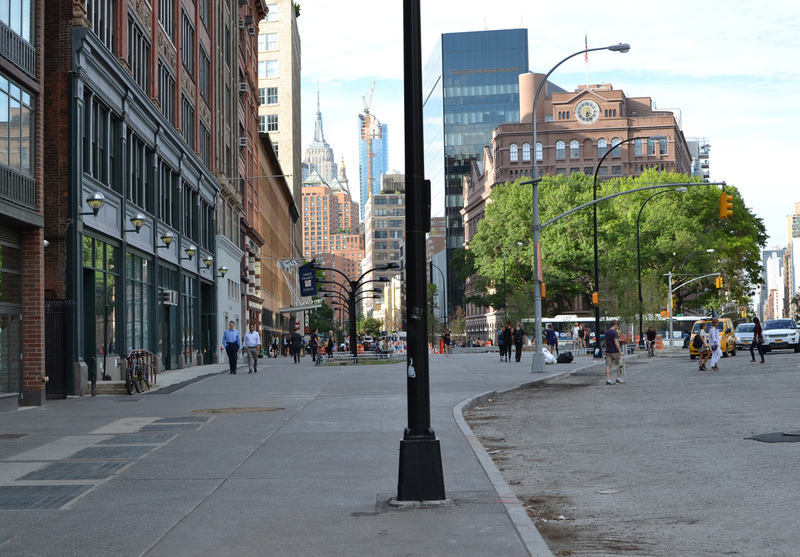 The NoHo Plazas – Astor and Village/Cooper Square – are nearing completion. The project began in 2008 with joint CB#2 and CB#3 meetings. Officially, there have been two plans presented by The Department of Transportation (DOT); the built version represents a third. 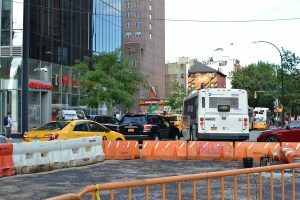 What prompted the entire Astor/Cooper Square renovation in 2008, was DOT’s insistence that the traffic patterns on the converging Astor Place, 8th St, Fourth Ave., St. Marks and the Bowery should be improved. Then came the bike lanes deleting a full lane and the bump-out at the Public Theater that deleted another full lane of traffic on Lafayette as it entered Astor Place. The Astor Place roadway from Broadway now ends at Lafayette St. with traffic intending to go east diverted north a block to 8th St. On an eastern artery from 6th St to Fourth Ave, which was intended as bus layover only, there is now a layover plus two lanes and the traffic that was to be diverted to Bowery/Third Ave. continues to have access going north to Fourth Ave. 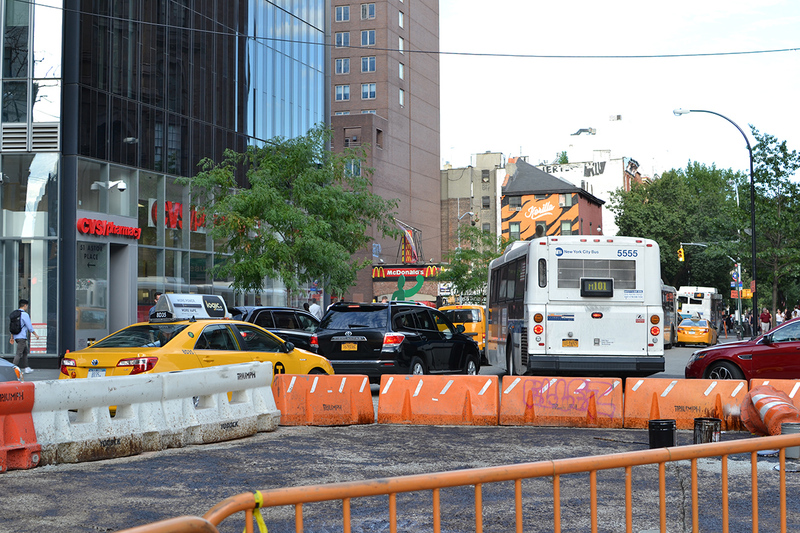 The result is a very busy interrupting highway through the middle of Cooper Square Plaza, with no pedestrian markings or warnings, that dumps into the intersection of 8th St and Fourth Ave with buses either turning east or parking on a two lane road with two lanes of traffic. Additionally traffic and a bike lane enter from the west. What’s the difference? Lots of vehicles caught in the middle of light changes, intersections clogged, pedestrians confused and still walking between vehicles standing in crosswalks. We expect DOT to say, “But we’re not finished yet!” In the meantime, however, given the massive chaos, it would be quite appropriate to have traffic cops there to mediate. With each new plan the NoHo Plazas added pavement and decreased in greenery. 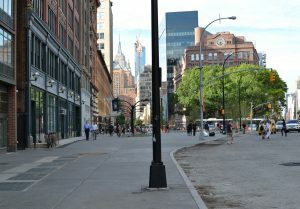 While it will take awhile for the trees to grow and the Cooper Square Plaza planters (to be cared for by students at Grace Church High School) there is still a vast pavement, vacant of seating and begging to be filled with the Street Activities Permitting Office (SAPO) salivating at the opportunity. BUT, there is more. Recent City Council legislation regarding NYC’s multiplying Plazas and meant mainly to address Times Square and Herald Square gave little or no consideration for Plazas in mixed-use neighborhoods. Thus, rules pertaining to maintenance and use of the Plazas were given over to The Dept of Transportation (DOT) and to the Street Activities Permitting Office (SAPO) which also assumes no difference between commercial and mixed use neighborhoods. DOT, having no resources for maintaining the Plazas they create or their security, has set up a Plaza Partners Program where the “partner” promises to maintain amenities and provide pubic security. This is no small responsibility or expense; the result is that most Plaza partners are Business Improvement Districts (BIDS) or commercial entities. For mixed use neighborhoods the result is commercial invasion of what was touted as a public amenity. There are additional wrinkles to this scenario…the only allowed income generating option is a concession (e.g. Shake Shack) contracted through DOT with the Plaza Partner as a beneficiary of some percentage of the profit or fee. And all this with little or no review by the community or Community Board overseeing the district. Luckily, CB#2 spotted the major flaws and approved an advisory resolution delivered to DOT and elected representatives. You can read it here. Thus far, however, no response. At a recent DOT public hearing for comment in the new proposed rules NoHo-Bowery Stakeholders delivered the attached testimony with particular regard to the NoHo plazas. No response. UPDATE; SAPO has released their new proposed rules along with instructions for public comment. The Deadline is August 8th. We will distribute an analysis and suggested response as soon as we have conferred with CB#2’s Traffic and Transportation Committee. In the meantime, there’s a grand opening for the NoHo Plazas planned for September 15-17. NoHo-Bowery Stakeholders has agreed to coordinate historical (The Merchant’s House Neighborhood Tours), cultural (hopefully The Bond St Theater’s Stilt Band) and child-friendly contributions (NYU Sorority Facepainting Tent) in an attempt to demonstrate the neighborhoods interest in non-commercial activities on the Cooper Square Plaza. The Village Alliance BID already has their Astor Plaza website running.